As promised, another classic strip that has been updated for your approval. Well, maybe not your approval so much as my own amusement. Some differences you might notice in this one are the format of the panels (horizontal as opposed to vertical rectangles) and the direction in which the birds are facing. It makes more sense to have the characters facing right, since that is the direction people read (left to right [in English anyway]). Comics 101: Lead the reader’s eye by using directional elements. 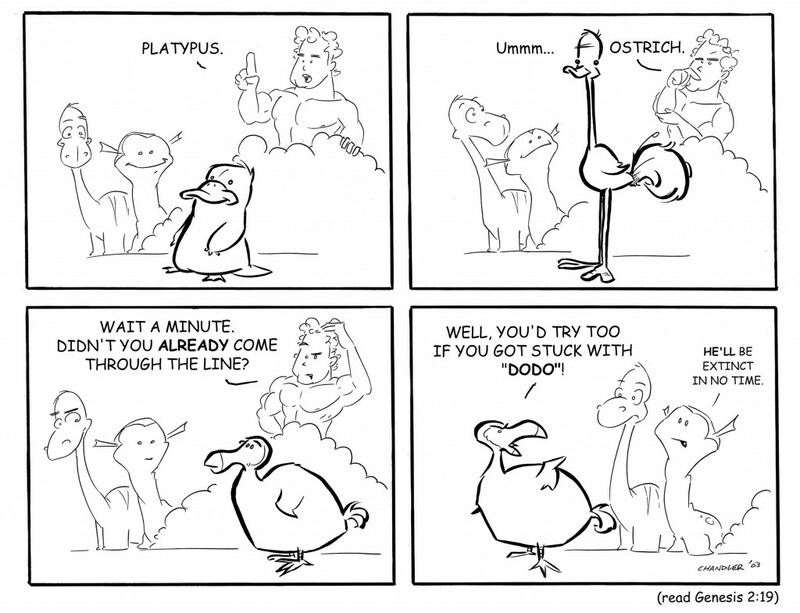 The platypus and ostrich are characters that I created for another comic strip idea I had called “Plat & Ozzy” which pre-dates Moth & Ethan. The dodo doesn’t have a name, so don’t ask him. He’s kind of sensitive about it.